"Advisor of Kings 王佐之才 (wáng zuǒ zhī cái)"
Together with Guo Jia 郭嘉, Xun Yu was one of Cao Cao 曹操's most trusted advisors. In fact it was Xun Yu who introduced Guo Jia into Cao Cao's service, together with a host of other high-calibre individuals such as Xun You 荀攸 and Sima Yi 司马懿. In one of the most controversial moves of the era, Cao Cao's escortation of the emperor, resulting in Cao Cao wielding immense political power, was suggested by Xun Yu. However Xun Yu's heart was always for the protection of the Han Dynasty 汉朝. When Cao Cao ultimately intended to abolish the Han Dynasty and establish the kingdom of Cao Wei 曹魏, Xun Yu opposed through oblique statements. This did not sit well with Cao Cao, and thus Xun Yu fell out of favour. He died soon after. Character ability 1: "Rouse the Tiger 驱虎 (qū hǔ)"
During your action phase, you can conduct a Points Duel with a player with more health than you. If you win, that player inflicts 1 unit of damage to another player within his/her attack range of your choice. If you lose, that player inflicts 1 unit of damage to you. Character ability 2: "Eternal Loyalty 节命 (jié mìng)"
There replenishment for "Eternal Loyalty" has been capped at 5 cards max. 驱虎 is the shortened form of a longer phrase 驱虎吞狼. The literal translation is "rouse the tiger to eat the wolf". It is referring to Xun Yu's amazing strategy where he proposed to Cao Cao to have Liu Bei rewarded to the post of magistrate. Then Cao Cao can command Liu Bei to attack Yuan Shu 袁术. The sinister strings behind it all is Xun Yu knows the rule-abiding Liu Bei will listen to any order given by a superior, which is Cao Cao at that time. Xun Yu also knows that Yuan Shu is an egomaniac and secretly tells him that Liu Bei is coming to attack him. This way, both of Cao Cao's enemies are put at loggerheads and he benefits regardless of outcome. 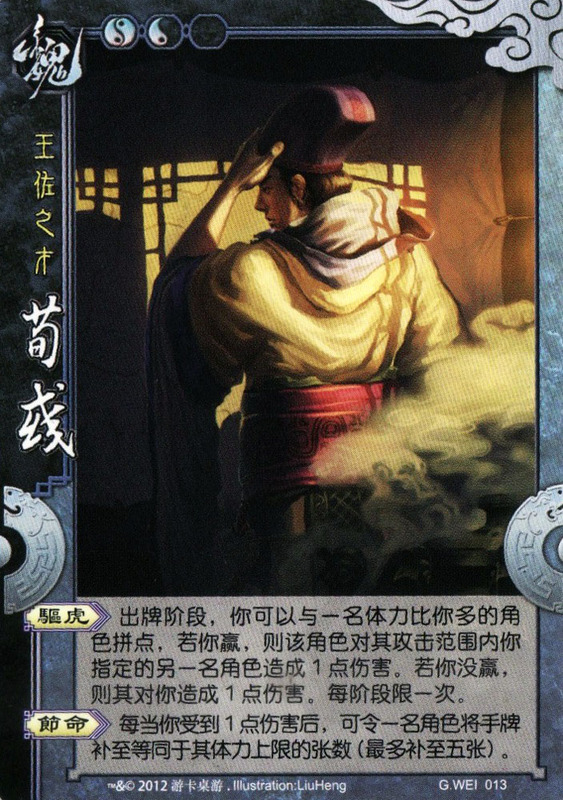 "Eternally Loyalty" refers to Xun Yu's undying loyalty to the Han Dynasty, though its relation to the mechanics of the ability is weak.